The Miller Digital is equipped with lens technology makes welding jobs easier to see, while reducing strain on the eyes. Thousands of items are welded and transported all over the world. People doing this job need protection from the fiery spark of the welding tool. The Miller Digital Elite Black Welding Helmet is sturdy, reliable, and designed with advanced features. 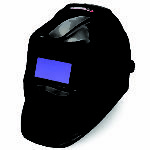 The Miller 281000 Digital Elite Black Welding Helmet has a viewing range of 3.85 X 2.38 sq. in. 9.22 sq. in. (97 X 60 mm). 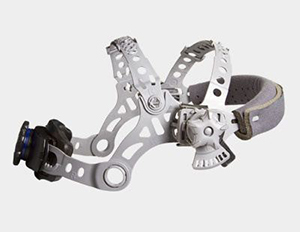 This helps the welder see from multiple angles without risking eye injury. Whether splashes are radiation or gasses, the choice of headgear is important to quality welding. Get the best possible protective shield to protect face, and eyes from damage. The intense ultraviolet rays emitted by welding equipment require a quality designed helmet and shield. Injury happens easily while welding. Seeing items of interest with clarity decides important for the welder and the quality of the product. The operating mode settings help welders using the Miller 281000 Digital Elite Black Welding Helmet perform better. For those investing in training, remember to finance a superior welding helmet. Welders perform intense activity. Sparks are hot, bright, and welders look at each piece of material with intense focus. This activity exerts tremendous eyestrain. 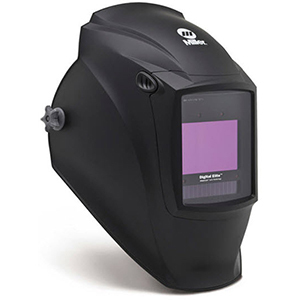 Yet, the Miller 281000 Digital Elite Black Welding Helmet handles the brightness, and heat produced by welding instruments from a clear viewing screen. The helmet transports easily and weighs only 25.7 ounces. Always protect the lens from damage. Like a windshield. If damaged the glare while welding might prove dangerously distracting. The welding industry needs people, and they need equipment. Use the lightweight Miller 281000 Digital Elite Black Welding Helmet and focus on the job. A helmet that constantly encumbers visibility, producing reflections and causing difficulty in changing light offers little assistance on a busy welding job. 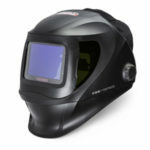 The hood of the Miller 281000 Digital Elite Black Welding Helmet delivers a great fit. Designed for comfort, the helmet fits wonderful on pros or beginners. 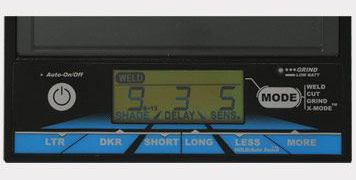 The device sits on the head in a stationary position, locking in place. The ergonomic design provides extra comfort for the neck area. 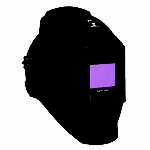 Users are able to add a few comforts like sweat bands to increase the advantages of using the Miller 281000 Digital Elite Black Welding Helmet. The comfort of making brackets, furniture, tables, or lifts increases with digitally regulated helmets. The helmet operates with an on/off switch providing lens control. The sensor lens speed moves at a rate of 1/ 20,000 per sec. Operating in four modes, these processes: Cut Mode (#5-8), X-Mode (Shades #8-13), weld mode (#8-13), and Grind Mode (Light State #3.5). The choices are within control of the helmet user, without any assistance. The unit provides four sensors in the arc the welder controls. The Miller 281000 Digital Elite Black Welding Helmet operates with an electromagnetic sensor that eradicates the problem of blinding sunlight. It operates indoors, or out with the same efficiency. The helmet stands equipped with a low-amperage lens. The .10 to 1.0 second delay prevents unintentional welding activity. The price of the Miller 281000 Digital Elite Black Welding Helmet fits most budgets. The device has a three-year warranty practically guaranteeing satisfaction. Included in the cost are two lithium batteries with extended lasting power up to 3,000 hours when assisted by solar energy. The face lens, sold in groups of five makes the purchase more economical when buying this highly developed welding helmet. Affordability certainly matters. 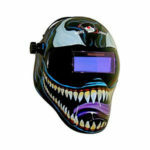 However, a welding helmet with unique features makes creating any item easier. The helmet packet includes two cover lenses for the inside, five for the outer area and a carrying bag. Additional opening are the TIG Lens intro, hidden cavity, Pipe/Curves, sensitivity and obstruction sensor. Gain the advantage of auto darkening while using the helmet. Filled with features that make it special, the helmet has an external grind button easily accessible for the user. If you have a welding job to do. Get a great welding helmet at an affordable price. Do more jobs without help, and get more work done in a shorter span of time. The helmet is a real convenience, opening the door for a variety of welding jobs without changing helmets.